Counties shaded in gray are part of the Hungry Canyons Alliance. Bridge endangered by exhumation of pilings. Straightened versus meandering stream. (Walnut Creek, Pottawattamie County). HCA steel sheet pile weir with riprap and cement grout that protects a large sewer main for the City of Denison, Iowa. 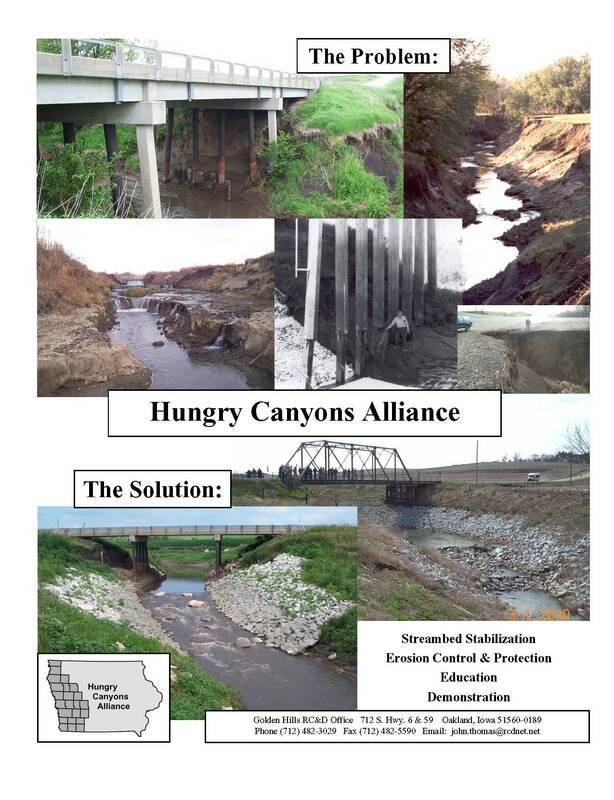 The Hungry Canyons Alliance (HCA) was formed locally to research and implement solutions to the problem of stream channel erosion and degradation in a 23 county area of the deep loess soils region of western Iowa. Channelization of streams and land use changes during the first half of the 1900’s caused stream channels to erode, causing an estimated $1.1 billion in damages to public and private infrastructure (bridges, culverts, utility lines, etc. ), loss of farmland, and increased sediment loads. A survey of western Iowa bridges in 2000 revealed that 404 were endangered due to stream channel degradation. Golden Hills RC&D in Oakland, Iowa helped to form and currently provides office space and administrative assistance to the Hungry Canyons Alliance. An affordable solution to this problem is to build grade control structures in streams. Streambed stabilization is the key to preventing further erosion and protecting infrastructure. Grade control structures at regular intervals will help streams stabilize by changing their profile from an erosive steep incline to a stable stair-step pattern. Structures, which normally have a raised weir section and are constructed with steel sheet pile, riprap, and concrete grout, allow the stream elevation to drop in a controlled setting, while preventing further degradation, and create a calm backwater condition that allows silt to settle out upstream, decreasing sediment loads and turbidity, and increasing water quality. The HCA provides state and federal money available to the 23 counties through a cost share program for streambed stabilization structures. County governments provide a minimum of 20% match for each structure. Since 1992, the program has provided $20.5 million in state and federal appropriations and the technical assistance needed to complete 290 grade control structures in 17 counties in western Iowa. Another 29 structures are in progress. These structures will protect an estimated $77.75 million in property value. It is estimated that 570 acres of land, equivalent to 20.1 million tons of sediment, will be protected from erosion by construction of the 319 grade control structures. HCA streambed stabilization structures, with an average cost of $64,845, protect approximately $243,731 in property per structure. For every $1 invested in Hungry Canyons Alliance streambed stabilization structures, more than $4.24 of property value and an average of 0.98 tons of sediment are protected from streambed degradation. During FY 2008, 15 HCA structures were approved for cost share and construction was completed on another 13. A second HCA program provides funding to landowners where grade control is necessary to stabilize active gully erosion. This program is funded with the interest earned from state appropriations. This program has built 84, and approved another 9, structures for a total cost share of $619,406. The HCA has quarterly meetings at which issues concerning stream erosion and streambed stabilization are discussed. Regular attendees include county engineers, county supervisors, NRCS employees, SWCD commissioners, DNR fisheries biologists, engineer consultants, contractors, and concerned landowners. that the HCA makes available to the 23 member counties. Eighteen (18) western Iowa counties were declared eligible for federal disaster assistance due to severe rains in May 2007 and June 2008 which caused flooding and stream channel damage, endangering or destroying county infrastructure. This was the worst flood to hit western Iowa since 1993. The damage due to flooding was exacerbated by the highly erodible loess soils found throughout the counties. FEMA, NRCS, the Hungry Canyons Alliance (HCA), and the counties have all seen evidence that grade control structures have directly reduced flood damage costs and FEMA/EWP claims, as shown in numerous instances following the flooding in May. The vast majority of grade control structures were undamaged, and infrastructure protected by grade control structures had no damage. A small proportion of these grade control structures also suffered damages during the flooding, however, the damages to these structures are minimal compared to the total loss of our bridges that may have resulted without these grade control structures. The Hungry Canyons Alliance (HCA) was asked by its member counties to help lobby to secure EWP funding for their flood damages. The sole purpose of the HCA is to mitigate the effects of stream channel degradation on infrastructure and farmland, and EWP funding would complement the HCA’s mission without duplicating it. So in April 2008, representatives from the HCA made their annual trip to Washington D.C. to request federal funding for the HCA, but this year also did some lobbying with Iowa’s federal legislators on behalf of the NRCS-EWP program. Examples of damages caused during 2007-2008 floods. Top) Scour on downstream side of over-topped roadway, Bottom) scour downstream from weir structure built without a stilling basin. In June-July 2008, the appropriation bill for the Emergency Watershed Protection (EWP) program of the USDA-NRCS was passed, of which roughly $13 million is eligible to be used in western Iowa. Of the 451 damage survey reports filled out by the NRCS, 206 are in western Iowa. Of the 206 western Iowa projects, approximately 155 are flood repair projects which provide grade control or are directly associated with existing grade control projects. Local governments are financially strapped at this time, so in order to make sure as many projects are completed as possible while the federal EWP funding is available, and to reduce the local counties burden to meet the 25% local match requirement for the EWP projects, the HCA has agreed to provide some of the match. The HCA will use state cost share (10%) to match the federal EWP funding (75%) and county funds (15%) for all EWP projects which provide grade control or are directly associated with existing grade control projects. The September and December HCA quarterly meetings served as important forums for the NRCS and county officials to meet and discuss difficulties with the EWP program. The HCA is providing technical assistance to the counties by documenting which erosion control measures have worked, which have not, and what new techniques can be used to enhance performance of the original erosion control design if it has not adequately solved the erosion problem. Aerial stream video was used to find the locations of actively eroding stream knickpoints, some of which are being monitored closely as part of a research project to measure knickpoint propagation rates in the field. The overall goal of the proposed research is (1) to examine the morphodynamics of actively migrating knickpoints for different flow conditions, and (2) to develop a knickpoint erosion model that is applicable to the deep loess area of western Iowa. An accurate knickpoint erosion model for loess will aid in the placement of future HCA grade control projects. The project will be conducted by the University of Iowa’s IIHR–Hydroscience and Engineering Department and will be financed with HCA state funds (20%) and by the Iowa DOT Highway Research Board (80%). Left: Knickpoint downstream from a sheet pile weir with a 20:1 riprap slope on Walnut Creek in Montgomery County. Middle: An actively eroding knickpoint (the white 5-gallon bucket for scale), moving upstream approximately 3 feet per year. Right: Knickpoint during May 2007 floods. Migrated 314 feet upstream by December 2007 eroding approximately 5,000 tons of sediment. ​The HCA has built two experimental grade control structures with scrap tires. Scrap tires are difficult to recycle and often reduce landfill capacity. The first phase of this project involved theoretical and experimental research done by Iowa State University. The second phase was construction of the prototype structures with the help of the NRCS and landowners. Scrap tires were arranged in layers, bolted together with lag screws, and filled with flowable concrete grout. The third phase of this project was the creation of a design manual which described construction technique and evaluated its cost, effectiveness, and structural stability compared to traditional grade control structure designs and materials. It has been distributed to county engineers and NRCS offices in western Iowa so similar structures may be built. The information learned will make any future scrap tire structure designs more cost effective. Top: First scrap tire project near Griswold. Bottom: Second scrap tire project near Treynor. The HCA has been working with the Iowa Department of Natural Resources (DNR) to design and construct weirs that will allow fish to migrate upstream. First, the DNR and HCA had a series of meetings to determine which streams were priorities for fish, such as catfish, to be able to migrate up and down. Second, the DNR and HCA agreed on a design that would allow fish migration. The design, exemplified by this structure (shown at right), consisted of a 20:1, horizontal-to-vertical, grouted rock slope downstream from a V-notch sheet pile weir. The two photographs below show a new weir design developed by the Page County Engineer. Fish are allowed to migrate over the structure by swimming up a gentle slope in the center of the structure through a series of alternating steel baffles that decrease water velocities and allow the fish to rest behind the baffles, while the structure still protects the bridge by providing grade control. The HCA and DNR continued to cooperate on a couple research projects to find the most cost effective structures that allow fish migration. The first study involved modifying two weirs in Cass County on Turkey Creek to a 15:1 downstream slope. Before and after the modifications, the DNR and the Natural Resource Ecology and Management Department at Iowa State University caught, tagged, and released fish from above and below the weirs. The major results of this study were: 1) catfish were documented moving over the 15:1 weirs, 2) fish communities were slightly better (5%) near the weirs compared with reaches without weirs, and 3) macroinvertebrate abundance and diversity was 60% greater near the weirs compared to reaches without weirs. This study was funded with HCA state funding (17%) in partnership with the US Geological Survey (22%), US Fish and Wildlife Service (15%), Iowa State University (35%), and the Iowa Department of Natural Resources Fisheries Bureau (11%). ​The second study, performed by the University of Iowa’s IIHR–Hydroscience and Engineering Department, measured velocities on different weir backslopes and performed modeling of different structure slopes to optimize for channel catfish migration while reducing flow velocities, slope lengths, and costs. There were two major results of this study. First, without considering drainage area, low gradient (20:1, 22:1, 25:1) grouted or riprap weirs and fish ladders performed the best. The medium gradient (12:1, 14:1, 16:1) weirs also performed satisfactorily. 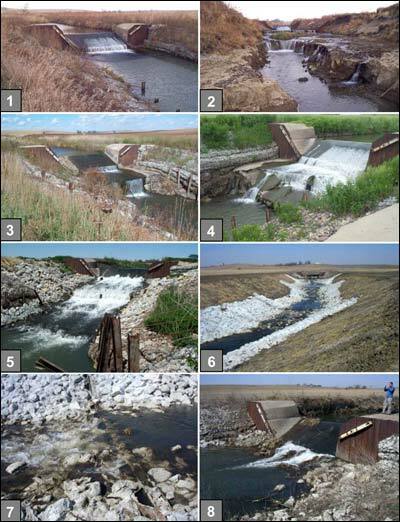 Second, when considering drainage area, it is recommended that when the drainage area is less than 20 mi2, the best structure is a low gradient weir because the variable controlling fish passage is the flow depth; when the drainage area is between 20 and 100 mi2, the best structure is either a low or medium gradient weir because the variable controlling fish passage is either the flow depth or maximum velocity; when the drainage area is larger than 100 mi2, the best structure is a medium gradient weir because the variable controlling fish passage is maximum velocity. This study was funded with HCA state funding (25%) in partnership with the DNR (25%) and the Iowa DOT Highway Research Board (50%). The DNR stream classification design criteria was changed to using a 15:1, horizontal to vertical, grouted rock slope, instead of a 20:1 (more expensive) slope, because of these two research projects. Page County sheet pile weir w/ fish baffles highlighted on an HCA tour. University of Iowa students readying the equipment to measure weir flow velocities. Iowa State University students and DNR biologists sampling fish and macroinverterbrates downstream from an HCA weir. ​Some gullies in the deep loess soils of western Iowa, especially in the loess hills region, can be very deep, reaching depths of approximately 70 feet, with near-vertical headcuts and side walls. The reason for this is that primary deposits of loess soil are highly erodible and unstable when wet, but unlike other types of sediment deposits, they are very stable when vertical and dry. Gullies expand and erode upstream during rain events due to surface runoff, entering the gully via the headcut, and due to groundwater flow, entering the gully at the base of near-vertical walls, both of which de-stabilize the gully walls causing bank collapse. Runoff then carries away the collapsed bank debris, preparing the walls again for collapse. Stabilization or control techniques are limited to pipe-drop structures, but associated fill of the gully and excavation of a core trench in an area of such high relief makes these types of structures often cost-prohibitive, and definitely not cost-effective. However, the only way to stop the cycle of gully erosion is to pass as much runoff, as quickly as possible, to the base of the gully by pipe. Top: The headcut was located at the second fence (behind the one in the foreground) only five years ago. Bottom: Large rapidly eroding gully north of Glenwood. Left: Directional drilling machine boring hole. Right: Basin (in which the directional drilling machine sits) built upstream of the terrace (at right) which is built upstream of the gully headcut (out of picture to the right). ​The HCA project director proposed the idea of using directional drilling techniques to bore a hole at an angle through the primary loess soil from upstream of the headcut to the base of the gully wall. A plastic PVC pipe would be inserted into the borehole and the bentonite slurry, used to drill the hole, would also act as the sealant that would make the borehole watertight as it dried. A vertical PVC riser would be added to the angled pipe to serve as an inlet. A water-retention basin would be excavated upstream of the inlet, and a terrace would be built downstream of the inlet, between the inlet and the headcut. The basin allows a larger storm event to be controlled by a smaller pipe. No work is done in the gully and there is no filling of the gully, dramatically reducing earthwork costs. The near-vertical gully headcut will gradually slump to a stable slope over time because collapsed debris will not be carried away by runoff. The HCA has built three of these experimental Bored Headcut Basin (BHB) structures to control three 30-40-foot deep gully headcuts with small drainage areas (< 17 acres) in the deeply incised small watersheds of the Loess Hills. Non-terraced sites were chosen to limit the amount of infiltration occurring upstream of the BHB’s. Survey and design assistance was provided by the USDA-NRCS. The three experimental BHB’s completed have averaged only $10,560 and have weathered >3 inch rain events without problem. Considering a typical pipe drop structure may have cost as much as $60,000, the BHBT has proven to be very cost-effective. We are continuing to monitor its progress, while planning for future more BHB projects. A 5 ft. concrete grade control structure (photo #1), built and maintained by Northern Natural Gas (NNG) since the early 1970’s, had been destabilized and nearly destroyed by advancing, in-stream, knickpoint migration (photo #2). Streambed downcutting had caused the structure to vertically control approximately 16 feet (photo #3), when it was only designed to vertically control 5 feet. The spillpad itself was starting to crumble (photo #4), was almost completely undermined, and was separating from the sheet pile, causing the sheet pile to begin to bow. The structure had a projected life of 0.5 to 1 year. 8) water backed up to base of original structure in spring of 2005. NNG had spent millions of dollars since building the original structure, trying to protect the structure from knickpoint migration. NNG had given up on the structure and was planning on re-drilling their pipelines under the stream to a greater depth, at a cost of $2.4 million, and allowing their structure to fail. In 2002, the HCA became aware of the problem and knew that allowing the structure to fail would destabilize Walnut Creek upstream from the structure, endangering 23 bridges and hundreds of acres of farmland. The HCA and NNG began discussing how the site could be stabilized. An agreement was reached in which the HCA provided technical assistance and coordinated repair of the existing NNG grade control structure and construction of three new HCA grade control structures downstream. Repair work was completed in spring of 2004 (photo #5), at a total cost of about $68,000, and construction of the three new structures (photo #6-8) were completed in spring of 2005 at a total cost of about $372,000. NNG and HCA paid for $358,000 and $82,000, respectively. The project saved NNG and its customers over $2 million. NNG has repeatedly expressed their appreciation for the HCA’s assistance and has begun modifying more of their grade control structures throughout the Midwest in accordance with what they learned in western Iowa from the HCA. According to Richard Troyer, NNG operations manager, "We relied on their expertise as far as erosion and developed some nice-looking structures. It is a win-win situation. It protects our lines and also farm land and area bridges." There are no gaged (measures water discharge) medium to small sized (less than or equal to 100 square mile drainage area) streams in western Iowa, which limits our ability to predict erosion. To remedy this, a semi-automatic, permanent, sensor network is being installed on 11 representative, ungaged streams in the deep loess area of Western Iowa. Stage-discharge relationships for these streams will be developed. The project will be conducted by the University of Iowa’s IIHR–Hydroscience and Engineering Department, the HCA, and possibly the U.S. Geological Survey, and it will be financed with HCA state funds (39%) in partnership with the Iowa DOT Highway Research Board (61%). The HCA is conducting an aerial assessment and classification of streams in the deep loess region of western Iowa to determine areas of active stream erosion and the impact streambed stabilization structures have on controlling stream degradation. Over 83% of stream reaches identified for aerial classification have been flown and 50% of the collected video has been analyzed. Upon encountering locations of extremely erosive streams and threatened bridges, the responsible county/agency was notified. The stream assessment consisted of flying along streams in a small helicopter while videotaping the stream channel and recording positions with a global positioning system receiver. Streams were classified based on a six-stage channel evolution model to describe the dominant channel processes occurring along stream reaches. Streams across the region in 1993 and 1994, and in a smaller area in 2000, were similarly classified. The comparison of the recent classification to those of the past allows us to describe how stream stabilization structures have impacted the streams and make predictions as to where future stream erosion will occur. The data may also be used to mathematically model channel evolution in the region. Approximately 5,940 miles of stream in 23 western Iowa counties will be classified during the 2002-2010 project. Videos and maps will be made available to county engineers and USDA-NRCS (Natural Resources Conservation Service) offices for stream stabilization project planning. The HCA provided all of the funding for this project using state funds. The classification data will also be used by the HCA and its member counties to identify the most actively deepening stream reaches that obviously need grade control, but because the erosion is so severe, the stream profile needs to be surveyed first along the entire reach to determine the amount of grade control needed and where the best location is to place a structure. Stream reaches flown to determine the stage of channel degradation. During the summer of 2007, the Iowa State Legislature approved the HCA’s and Guthrie County’s requests to make Guthrie County eligible for membership in the Hungry Canyons Alliance. Guthrie County has land that drains to the Missouri River, has areas that have deep loess soils greater than 20 feet in depth, has areas that have been identified by the Iowa DNR and US EPA as an ecological subregion with surficial deposits just like those of other HCA counties, and is currently experiencing active streambed degradation, especially in the northwest corner of the county in the Brushy Creek watershed. The geologic and hydrologic data we have now is better than it was when the HCA was initially formed; had this information been available in the early 90’s, Guthrie County would have been included in the HCA. Guthrie County has since joined the HCA as a dues paying member. 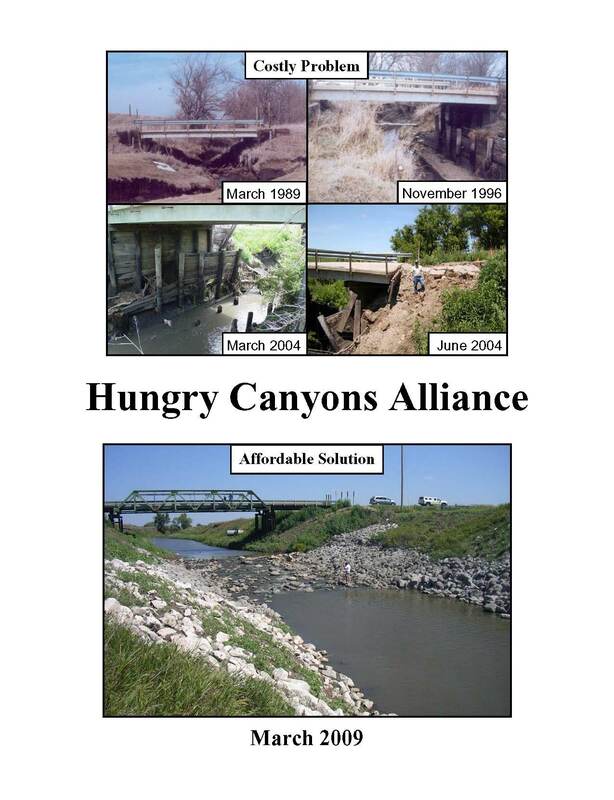 The Hungry Canyons Alliance will continue to provide the people of western Iowa with technical assistance and cost share for grade control structures as long as the need for stream erosion control exists and we receive appropriations from our state and federal legislators. Eastern Nebraska also has streams that have been channelized in areas of deep loess soils. These streams have responded in the same manner as western Iowa streams that were channelized; they are actively downcutting, which has caused damages to public and private infrastructure (bridges, culverts, utility lines, etc. ), loss of farmland, and increased sediment loads. However, unlike Iowa, nothing has ever been done at the federal or state level to prevent streambed degradation in eastern Nebraska. 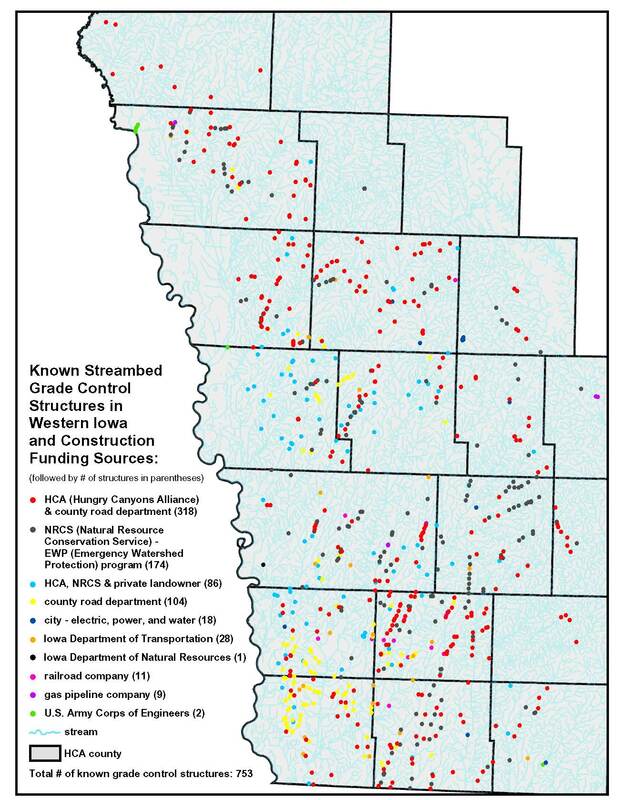 Because of this, the HCA has been asked to provide guidance to several parties in eastern Nebraska that are concerned about downcutting streams and who are trying to organize a group similar to the HCA to provide cost share for grade control projects in eastern Nebraska. This stream has downcut enough that a once buried gas pipeline was exposed and then severed by a falling tree in Nebraska. Left: Degradation on this stream has caused the near-vertical actively-eroding streambanks in Nebraska. Middle: This stream has downcut enough that once buried footings on a major state highway bridge in Nebraska have been exposed, endangering the bridge. Right: An actively eroding knickpoint in bedrock in SE Nebraska. Although, bedrock knickpoints move slower than knickpoints in loess, this knickpoint moved over 50 feet in five years.